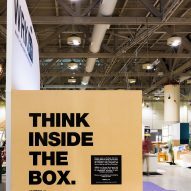 Canadian design studio SDI has presented its WRKkit concept for adaptable offices at IDS Toronto, using a booth modelled on a giant DIY toy. 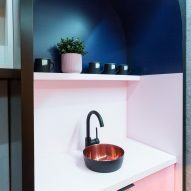 The WRKkit flexible office system was showcased during the trade fair earlier this month, inside a shipping container that was dressed up to look like a huge kit of parts. 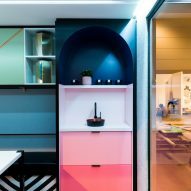 Locally based SDI Design created the prototype to demonstrate the potential of its modular workplace furniture, which is intended to be highly adaptable and easily reconfigured for any space. The project was a collaboration with Microsoft and Giant Containers. 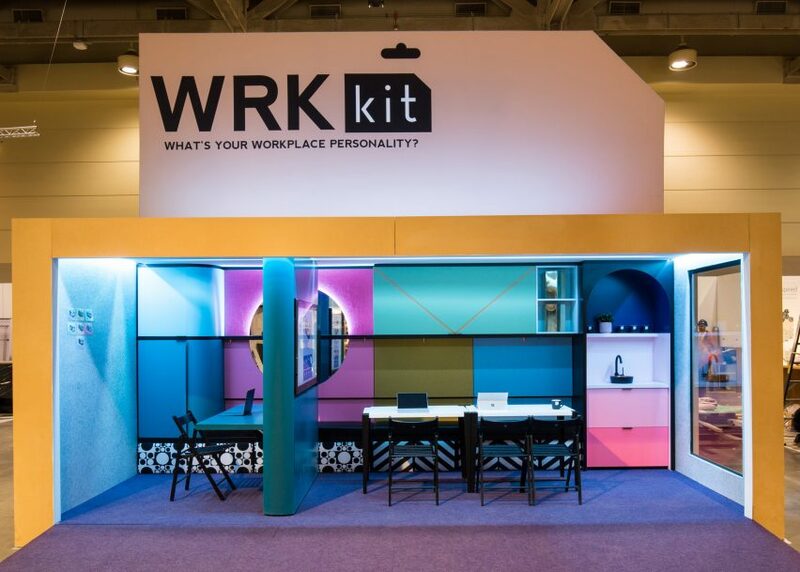 "The 2019 collaboration titled WRKkit focuses on the fact that every human is intrinsically different," said a statement from SDI. "There are introverts and extroverts, people that use the right side or the left side of the brain, people who are tall and people who are short. Yet, many workplaces are still designed predominantly using one-size-fits-all solutions." To demonstrate the different configurations that WRKkit offers, the installation at IDS was changed every three hours. This allowed visitors to see the moving parts in action. Colourful components including fold-out desks, seating, storage units, kitchen appliances, sliding partitions and more were shifted around to form a variety of setups. "According to real estate brokerages CBRE and Cresa, Toronto's real-estate availability in 2019 will drop to almost zero per cent so companies need to rethink how their spaces are being utilised," said the team in a statement. "SDI views WRKkit as an initial prototype for the future of work, where the workspace changes according to its users rather than forcing the user to conform." The team, which works on office interiors across Canada, came up with the idea after moving their own studio. They noticed that they became more productive in the new space, due to the flexibility it provided. "Our old space didn't allow for the flexibility of working in different environments," said SDI creative director Noam Hazan. 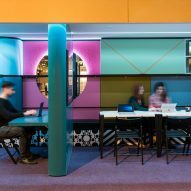 "Seeing our staff utilise the studio in a very different way reaffirmed our belief that one-size solutions don't work." The team worked with Microsoft to develop a personality test for potential WRKkit users. Answers to a series of questions determined one of seven possible working styles, which would benefit from a particular configuration. "The results show seven different typical configurations and provide advice about which activities best suit their personality and which technological devices are most supportive," SDI's statement said. Due to the size constraints of the container, the WRKkit prototype shows how little space is needed to apply the concept. The installation can also be easily transported, and the team hopes to show it at other events. IDS Toronto took place 17-20 January 2019 at the Metro Toronto Convention Centre. Also during the event, Marije Vogelzang created a sensorial experience narrated by a seed, as part of her installation for Caesarstone.